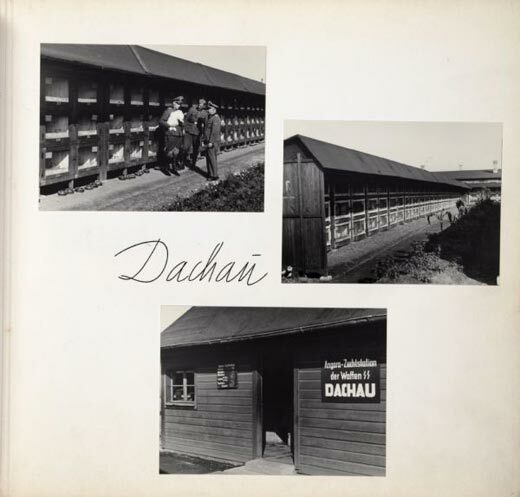 This collection of over 50 images comes from an unusual photo album about raising Angora rabbits at Dachau concentration camp in 1943. The album contains approximately 150 mounted photoprints, maps, charts and hand-lettered text, documenting the Angora rabbit wool raising projects operated by the Nazi SS corps at each of the concentration camps throughout German occupied territory where the corps was in charge. Images show the rabbits, their hutches, feeding, and shearing. It also documents the preparation of their angora wool, as well as other scenes. Sigrid Schultz acquired the album in 1945, which had been hidden in a barn near Tegernsee, Germany. Sigrid Schultz, former Chicago Tribune Berlin correspondent, presented her papers to the Wisconsin Historical Society in 1965. The collection included a heavy photo album, 15 by 13 inches, with one word on its grey cover — Angora. More tellingly — the cover also included the runic lightning flashes of the Nazi SS. 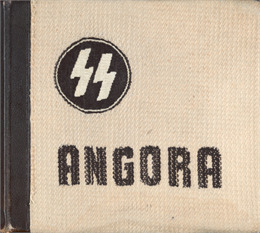 The album is covered in woven angora wool and dedicated to Reichsfuhrer Heinrich Himmler, chief of the SS and one of the most ruthless Nazi leaders. He oversaw a vast empire of secret police, slave labor, and death camps. The Angora rabbit project was an SS-administered program to breed rabbits for their soft, warm fur, one use of which was to line the jackets of Luftwaffe pilots. The rabbits were raised in luxury not far from the maltreated prisoners in 31 Nazi concentration camps in Germany, including Auschwitz, Buchenwald, and Dachau. The project was a showpiece for visiting dignitaries, as well as a constant reminder to prisoners of how little their lives were valued. 'The first picture was startling indeed; it was a huge photograph of the head of a handsome, obviously contented angora rabbit. Other pages showed rows of hutches that were model sanitary quarters, special equipment in which the mash for the rabbits was prepared that shone as brightly as the cooking pans in a bride's kitchen. The tools used for the grooming of the rabbits could have come out of the showcases of Elizabeth Arden.